Compared to how West European countries greeted Syrian migrants in 2015-6, Bangladesh's treatment of 1.2 million Rohingya refugees can only be termed graceful. Writing in Foreign Affairs, Sumit Ganguly and Brandon Miliate attributed the European responses to a fraying "commitment to humanitarian values" (September 22, 2015). Ours, contrariwise, stems partly from how India, under Indira Gandhi's leadership, handled 9.7 million Bangladeshis in 1971: camps were quickly built, we were fed, clothed, and reassured, much like Bangladesh's government is doing to hapless Rohingya refugees today. These are not the first to come, but how we continuously turn the proverbial 'other cheek' each time they stir the Cox's Bazaar hillside or seaside may become a luxury upwardly-placed or upwardly-mobile countries do not want to afford. Going back 47 years to the grim 1971 days exposes the cycle holding, but only just. Disparaging India's 1971 refugee influx is not difficult. Our migrants were too ragged, dirt poor, and ostensibly carrying diseases (or a diseased mind) to appeal to a foreign civil society. Yet, arms were opened, oftentimes by the very witnesses of the 1947-9 religious riots that accompanied India's partition. Oftentimes those arms welcomed over 50,000 migrants daily. Writing in the New York Times, Sydney Shanberg noted the refugees came in "swarms," often "so thick in the streets [of a typical border host community] that cars [could] only inch through" (September 17, 1971). Yet, they were absorbed. Indira frequently clarified that they would not only be returned, but returned "in safety" and "with dignity." She could do what she said and deliver every promise she made in a far more gracious way than, for example, Angela Merkel can today to the even more defiant Germans facing the incoming Syrian Muslim influxes. Circumstances differ, but no less for Bangladesh's assumed grace. Bangladesh's 1971 case was the largest "swarm" since World War II. Yet, it also boasted the most successful repatriation any case could claim: by the end of 1972, almost all refugees returned voluntarily. Indira delivered because the underlying cause was eliminated, something Merkel and her European counterparts cannot count on in Syria. Even though India did not ratify the 1951 Convention Relating to the Status of Refugees until 1979, it still abided by the document's three 'durable' solutions (repatriation, resettlement, or local integration), while upholding the Universal Declaration of Human Rights. If India's positive response is one reason why we Bangladeshis could show that grace, German-type populism is another why we may lose our Rohingya-treatment charm. Julian Francis sees many other ways that Bangladesh's 1971 refugee experiences speak to the concurrent global setting. Much like Bangladeshis in 1971, many Syrians precariously wander the world for safety. Currently almost as many people abandon their home each day across the world, Francis posits, as at the peak daily Bangladesh refugee arrivals, of about 40,000-50,000 then. Even though, like India in 1971, Bangladesh is both absorbing the rapid influxes quickly and rapidly repatriating them to safer destinations, hoping the long-term will repay this gesture, how long the 'long-term' becomes remains the test-case of our tolerance. Our eagerness to forge a Rohingya-return agreement with Myanmar, against strong UN recommendations, suggests we may be approaching our limits. As a previous Scopus column proposed (May 07, 2018 piece), creating Rohingya-built and Rohingya-staffed RMG (ready-made garment) factories within their camps might help Bangladesh avoid the European plight, and go one better on the Indian response. Yet, just as Europe's patience in absorbing refugees and migrants has run out, Bangladesh's too is beginning to evaporate. 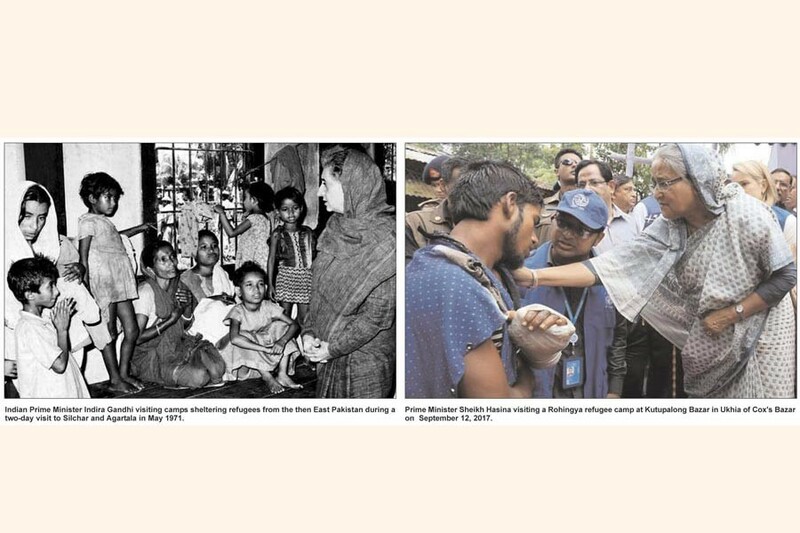 India's refusal to shelter Rohingyas in the way it did Bangladeshis in 1971 opens another angle of the same predicament. Its actual support for the Myanmar government not only echoes the declining humanitarian considerations Ganguly and Miliate found in today's Europe, but by also jiving with how it is fencing the Bangladesh border for quite some time shows the changing mindset. Treating its most valuable next-door neighbour far worse than it treated East Pakistan, fanning populism across Assam, and dubbing Bangladeshis across India as illegal migrants may be a function of India's upward socio-economic mobility, as too could Europe's sudden and so simultaneous populist outbursts. If so, one disturbing implication is the double-edged sword of wealth: on the one hand, it invites the 'huddled masses' from elsewhere, yet on the other, barriers are simultaneously, sometimes more expeditiously, erected. It was fortunate Bangladesh's liberation war happened when India was still parochial. On the 1971 India-Pakistan war, Scopus previously noted how Bangladesh's liberation war could easily help understand (and feed into) the dividing line between a dormant and resurgent India (as well as an introverted and expansive China). India's changing migratory mindset could push Bangladesh towards China in spite of China's pro-Myanmar proclivity. Yet, as if to balance the sine qua non Bangla-India relationship, Bangladeshis not only continue to travel to India, but in fact, continue in droves. The reasons why differ, but have been so mutually beneficial that we do not scrutinise them as much as we should: unlike the poverty-ridden, war/famine-stricken 1971 Bangladeshis, today's counterparts are upwardly-mobile consumers of such Indian products as tourist sites, medical treatment, shops, movies, and ancestral roots, while Indians coming to Bangladesh also search material goods, if not movies, then markets, if not historical sites, then investment partners, and if not medical treatments, then supplying white-collar skills. Perhaps materialism may be one of the bugs behind the declining humanitarian commitments globally that Ganguly and Miliate observed in Europe. Just as migration in 1971, with refugees being an extreme form, was a function of war, now as a function of peace, it has become far more slippery, nuanced, and complicated issue today. Just as we unwittingly provided India and Indira an opportunity window in 1971, which they fully opened and exploited to mutual benefit, Rohingya influxes must be seen as our own opportunity window. Creating a Rohingya RMG zone helps us to (a) convert expenses and inconveniences into future Bangladeshi and Rohingya gains; (b) open residency/citizen pathways for Rohingyas to quell the huge historical domestic Myanmar problem imposing incremental Bangladeshi burdens; (c) improve relations with Myanmar using China and India to mollify emergent bilateral irritants, so that Myanmar can come out of its self-generated cocoon and isolation and Bangladesh can nurture its Southeast pathways more efficiently; (d) demonstrate how a more proactive approach to a global problem can produce more efficient all-round results than the more reactive approaches evident all across the Atlantic zone; and (e) fulfil UN commitments while upholding its principles through other channels if only to show how the creeping UN obsolescence and dysfunction does not necessarily mean the end of multilateral cooperation. Without India's 1971 support, Bangladesh would struggle to knock on any Top-45 or Top-25 global club in this century. Without Bangladesh's magnanimous Rohingya initiative not being driven to its logical conclusion, Asia's most recent attempt at speaking with a globally louder voice will again fall short. That would unnecessarily bottle up both Bangladesh's and Myanmar's enormous potentials and regional salience, while also denying China or India one more feather in any global leadership claims.